Here's everything you need to know about Microsoft's latest big Windows 10 update. After months of testing, Microsoft has today released the Fall Creators Update for Windows 10. Windows 10 version 1709, build 16299, AKA the Fall Creators Update, has started to roll out, but the deployment will be fairly slow, with some users not able to get the new software immediately. Slow deployment aside, Microsoft has released a number of tweaks and improvements to its OS, some big, and some small. 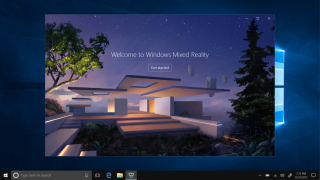 Perhaps the biggest change is the introduction of Windows Mixed Reality headsets. The Creators Update supported the development of VR and AR apps, but developers need to have developer mode enabled. This, however, is no longer necessary, as Mixed Reality support is now everyone's to try out. The second big change is the introduction of My People – a “quick access to your top people,” as Microsoft puts it. It allows users to pin people to the taskbar for one-click access. Bringing up those people allows users to send them an email, talk via Skype, or use any other communications platform. Cortana has also gotten a slight boost, and is now capable of shutting down, resetting or putting your PC to sleep. You can now annotate your books in Edge, pin your favourite websites to the taskbar, and edit URL for favourites. These are just the tip of the Windows 10 iceberg. There are also improvements in how Windows tackles ransomware, changes to the Store, and to the Windows Android Launcher. You can find the full list of changes on this link.